Drugs are big business, complex and highly profitable. UN estimates put the value of the global illicit drug trade at US$350 billion per year (cocaine generates somewhere between 80-100 billion of the total), one of the top most lucrative global industries, along with arms and oil. (r) The drug economy is integrated through the fabric of all societies and in almost every facet of the global economy: in agriculture, employment, transport, finance, bureaucracy… and that’s just the licit trade. The illicit trade of drugs extends into shipping, arms trading, legal, law enforcement and incarceration costs for starters. When we add to that the other side of the balance sheet, health care and treatment, education and prevention and the social costs borne by society for the management of drug use and abuse we can appreciate the complexity of the economic perspective of “drugs”. Drugs drive economies, economies depend on them and governments are always walking a fine line between public interest in regulation and control and the huge financial benefits of taxation. Depressed economies can fuel drug use, just as the pressures of a growing economy can. So the swinging pendulum of drug use is highly connected to the fluctuations in the economic aspects of both the drug trade and the economy within which it operates. The drug trade, whether legal, regulated or prohibited will remain a strong driver of the global economy well into the future. By the early 1500’s, the Inca plantations were taken over by holders of Spanish land grants and tax laws were revised to allow growers to make tax payments in coca leaves. By 1539, the Church was collecting tax on production at a rate of 10% of the crop. A rapidly growing agribusiness, it is estimated that by 1575, 82% (between 1500-2000) of European settlers in what is now Peru, were involved in the coca trade, essentially selling coca leaves to the Indians. By 1600, the coca trade had become a major colonial economic force, with a localised trade valued at half a million pezzos annually, in Potosi alone, with the sale of coca to immigrant workers now commoditised. Europe largely ignored coca until it was discovered that when mixed with ethanol, which helped release the active ingredient, it could be used as a stimulant. By the 1860s, cocawine (such as the famous French Vin Mariani, a tonic based on a mixture of coca leaf extract and Bordeaux wine), and other preparations were widely embraced throughout Europe and America, and a booming industry in patent medicines and tonics with coca extract as the base was born. Vin Marini was the perfect marriage of wine and coca, as any loss of potency in the coca leaf extract was compensated for by the effect of the alcohol. Vin Mariani found a receptive market in the US, however the later genesis of a similar imitation was to transform the coca industry. Coca Cola was introduced to the market in the mid 1880s and with it, the American obsession with coca led to its unprecedented and enduring commercial success. The addition of the caffeine containing Kola nut to the beverage only made it more refreshing and brought lovers of Coca Cola back for more. Britain and France too joined America’s love affair with coca. But the Germans who had first isolated the cocaine alkaloid from the coca leaf were to rather take to the precision, reliability and intense power of cocaine. 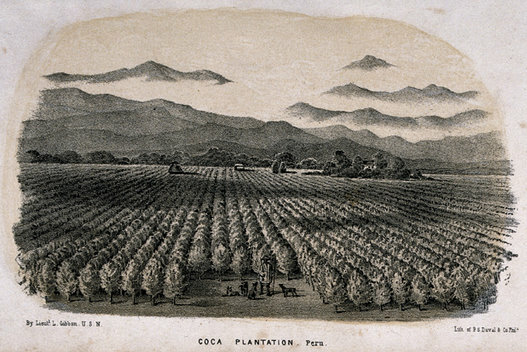 The growing pharmaceutical industries in the US and Europe, in particular Merck (Germany) and Parke-Davis (US) were also dependent on coca production for the manufacture of cocaine, so the stage was set for lasting investment at both the agricultural and manufacturing levels on both sides of the Atlantic. In 1888, Merk’s production of cocaine sat at 300kg, to become its staple product. 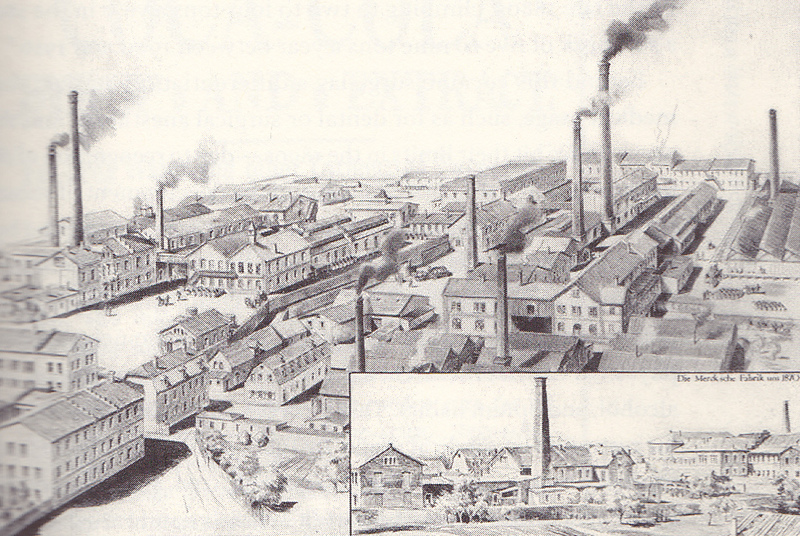 Cocaine production peaked at 1500kg by 1910, becoming its most profitable line and helping propel Merk’s rapid growth. By 1910, the estimated US use of cocaine was somewhere between 5-9 tons per year, being supplied by both US and European manufacturers. Peru also had a crude cocaine industry that supplied Europe, but by 1915, the legal cocaine trade effectively ended with the US ban enacted the year prior. So what happens when a booming agricultural and pharmaceutical industry supplying a hungry market is stopped in its tracks? The transition for manufacturing in the legal cocaine industry in the US and Europe was channelled through the production of other products. But for the source of the drug, Peru, Bolivia and Columbia, it became a transition from a legal trade to an illicit one. Clearly, until the enthusiasm for recreational cocaine use dwindled in the 1930s, cocaine was still widely available. In Europe, much of the illicit cocaine came from pharmaceutical theft, but in the US, most of it came from South America from the growing illegal trade. By the mid 1990s in Colombia, Bolivia and Peru, cocaine was Latin America’s second most important export after petroleum. The drug’s traffickers reap annual revenues estimated at $9-10 billion. Cocaine accounted for approximately two-thirds of all United States spending on illicit drugs..$31 billion of the country’s $49 billion retail market in 1993. Americans spent more on cocaine than on airline tickets, petrol or magazines and newspapers. Fundamentally, cocaine is an economic phenomenon. It is an important, if illegitimate, producer of wealth and income in South American countries. Mexico’s drug traffickers have established factories, warehouses and trucking companies as legal fronts to take advantage of the cross-border commerce opened up by the North American Free Trade Agreement. Ownership of banks, financial institutions and travel agencies provides cover for laundering drug money. Panama’s General Manuel Noriega reportedly accepted almost $5 million from the Medellín cartel in the 1980s and permitted the cartel to ship more than four tons of cocaine through Panama to the United States. He was convicted by a U.S. federal court in 1992 of drug trafficking, money laundering and racketeering and sentenced to 40 years in prison. In Colombia, guerrilla organizations have collected more than $700 million in the 1990s by taxing the cocaine and heroin trade and by processing these drugs themselves. Other guerrilla activities, including robbery, extortion and kidnapping, yielded approximately $800 million. The war against guerrillas has bled the economies of Colombia and Peru of billions of dollars and killed thousands; in Colombia an estimated 17,000 people died as a result of guerrilla actions between 1990 and 1994. In Latin America the narcotics trade is associated with production and trafficking rather than with consumption. According to a 1992 survey, only 1% of the Colombian population had used cocaine at least once, compared with over 9% of the population in the U.S. In Peru and Bolivia, the figure ranges from 1 to 3%. U.S. law enforcement and public health costs related to drug abuse is estimated by the White House to be $67 billion annually. Estimates suggest that earnings from cocaine’s economic are equivalent to approximately 5% of GDP in Bolivia and Peru and 8% in Colombia. Ownership of agricultural land by drug dealers directly or through intermediaries increased from 1 million hectares in the late 1980s to an estimated 3 to 4 million hectares in 1993-94 and 8 to 11% of Colombia’s agriculturally usable land by 1996. In contrast with alcohol, cocaine in the modern era has existed in a state of two extremes, unregulated (with some taxation) or totally prohibited. In the unregulated scenario, it was put to use to boost productivity in arduous workplaces, and medicinally, amongst other things, was used to treat “brain fatigue” of stressed white collar workers. In the prohibited scenario, it is used in much the same way, but through individual administration. Today we use many other drugs to keep the work force going, starting with Ritalin, administered to thousands of children around the world to improve concentration, academic performance and compliance in institutionalised education. As we mature, anti-depressants, anti-anxiety medications and a whole other collection of legal medications keep us marching to work without having to address the cause of dysfunction. Long haul transport workers use legal or illegal stimulants to keep going and meet deadlines. And most of us make good use of the workplace coffee and tea facilities to get over the 2.30pm afternoon slump. Unlike alcohol, historically, governments have not had to weigh up the prospect of varying degrees of regulation and taxation with regard to cocaine as the current global regime has been so heavily weighted toward total prohibition. However, many countries have enacted changes to the prohibition to move towards decriminalization, whilst still maintaining a legal ban on the use of cocaine. This has been done in an effort to reduce harm and reduce the huge financial and social costs of law enforcement and incarceration. In the case of countries like Portugal, it has been to stem the spread of HIV. 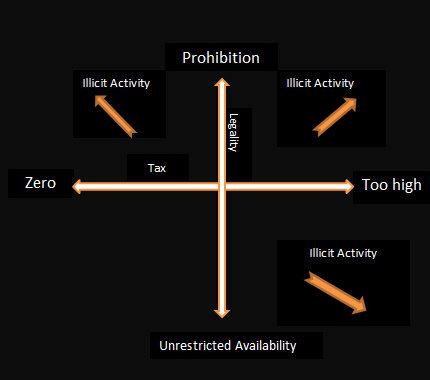 We can visualise the incremental ways that changes in drug use change according to the degrees of prohibition and the level of taxation applied to a legal but regulated industry. These can intersect with other matrices which might include punishment and redirection of taxation revenues.